From October to December last year, I did maybe 20 hours of work. Not 20 hours of work per week, but 20 hours total, over the course of those 12 weeks. I was living in Argentina and the passive income from my app, site, and courses were providing more than enough to live on while still saving aggressively. That’s not to say I was just lounging around in cafés drinking Malbec, though. I was writing a book, creating articles for this site, learning programming, practicing some Spanish, and okay yeah doing a decent amount of lounging around in cafés. That lifestyle was great and could have gone on for a while, but it would have dried up eventually. Google ranks fall, expenses increase as you get older, and not everywhere is as cheap as Buenos Aires. So since returning to the states, I’ve been putting more thought into designing a plan to create a financially-free lifestyle with more permanence and security. In the process of planning and designing it, I realized that anyone else who reads this site could do the exact same thing. It might take longer or shorter depending on where you are in life, but anyone could plan, save, and invest to the point of financial freedom within 10 years depending on how aggressive and determined you are. Not necessarily so you can go chill on a beach and do nothing for the rest of your life, but rather to free you up to do whatever you want. That could be financially productive pursuits like starting businesses, but it could also be creative pursuits like art, music, travel, language learning, whatever you’re passionate about and want to spend more time on. So if you too think that the idea of working 40-60 hours a week and having to wait until you’re 65 to sail off into the sunset sounds ludicrous, and want to rapidly accelerate that, read on. P.S. 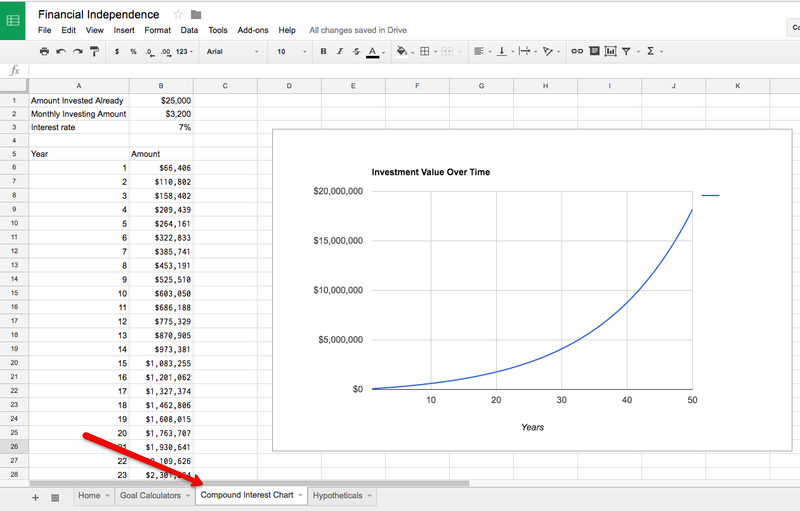 Of course, an article like this wouldn’t be complete without a spreadsheet, which you can get for free here and make a copy of to follow along with. Our goal is to reach a point of financial freedom where you no longer have to work for money, and where you’re reasonably sure that you won’t have to in the future. The only way that happens is if you either have such an absurd amount of money in the bank that you can draw it down for the rest of your life, or if you’re receiving enough money to live off of from sources that don’t require ongoing work (passive income). The first case is great but not something we can reasonably plan for, so we’ll focus on the second one. The math is simple: if you’re receiving more per month in passive income than you’re spending, then you’re financially free. But for planning and goal setting, we can break it down into a few levels, based on a simplification of the tiers Tony Robbins outlined in Money: Master the Game. This helps clarify how much you need, and also gives us a few goals to shoot for. First, there’s “Financial Security,” which means that your mortgage, utilities, food, insurance, and other very basic needs are covered. You aren’t going out to eat much or going on trips, but you’re surviving, and you could get by on this income indefinitely. Let’s say you want to live in Austin Texas. You could very reasonably have financial security at around $2,500 a month, assuming you don’t have kids or much debt. You wouldn’t be in any big fancy apartment or eating out much, but you’d be secure. This is your first goal. Then, there’s Financial Independence, which is whatever the current lifestyle you have costs. It’s the number where you wouldn’t have to change how you’re living at all if you left your job or stopped working. The easiest way to figure this out is to look at what you’re spending each month right now. Or, if you want, figure out what you could be spending each month and be just as happy with (more on that later). 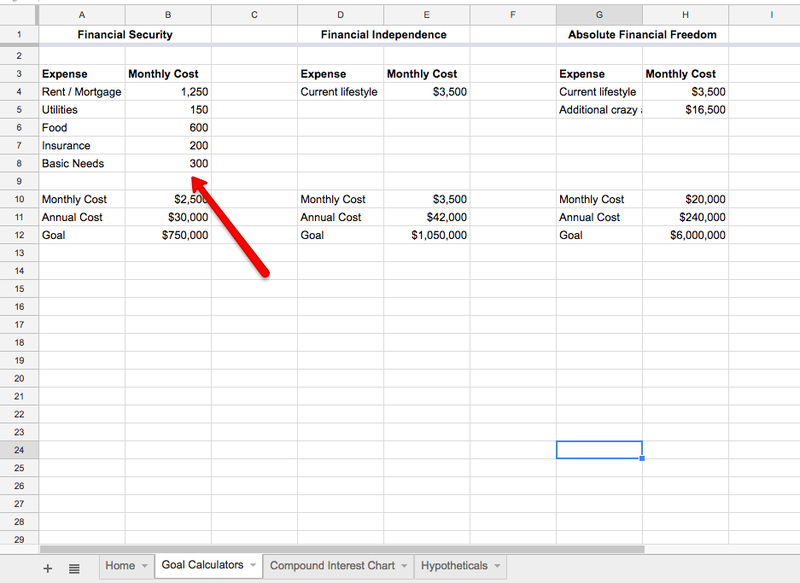 Whichever number you decide on, go ahead and put that as your monthly cost in the calculators tab. Finally, there’s Absolute Financial Freedom, where you have more money than you know what to do with. This level varies widely depending on your desires, but is likely some multiple of what you’re earning right now. There are a few ways to figure this number out for yourself. You could pick an amount where you would have no idea what to do with it, or you could come up with a few things you think you want in your life and calculate the monthly cost of them. For me, this number isn’t that high since I mostly just want to travel and eat and buy books, all cheap if you’re smart, but if you’re someone drawn in by the mansion, fancy car, and private jet, this could be really high. 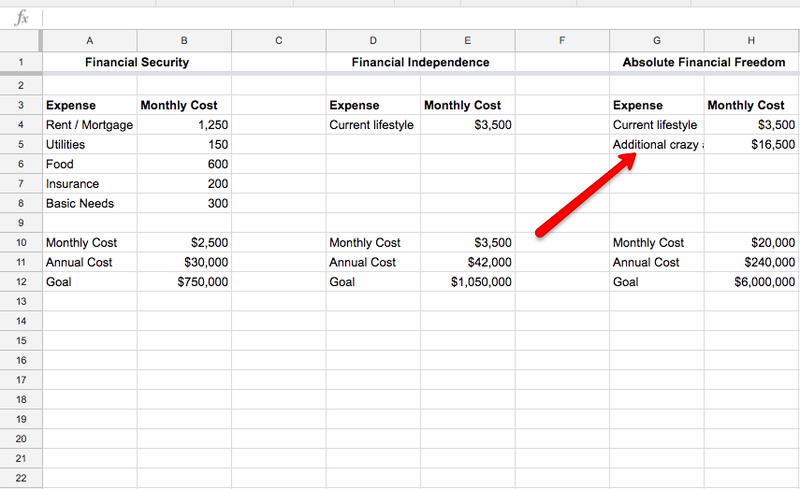 There’s no need to reduce it to something reasonable, this is your BIG financial goal, so put whatever sounds exciting in the spreadsheet. 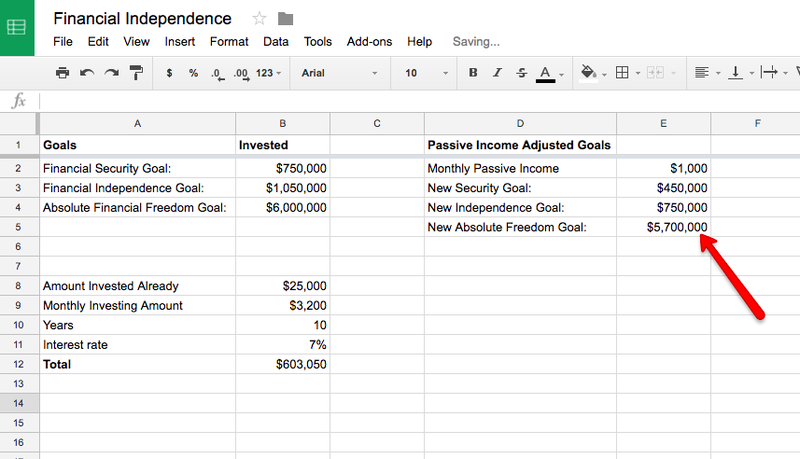 Alright, now that we have our three income goals, here’s how we can make them happen. Your goal is to build up enough non-work income (or potential for non-work income) that you hit your Security, Independence, and Absolute Freedom levels. And more importantly, to be reasonably assured that it’s not going to suddenly disappear tomorrow and leave you in the lurch. Those sources break down into two categories: Investments, and Passive Income. Investments are the classic way to achieve financial freedom and typically the most stable. Once you have enough money invested in a diverse set of stocks and bonds, you can live off of the interest it earns each year and no longer have to work. Here’s how that math works out. Let’s say you have $100,000 invested in Wealthfront (my preferred place). We’ll assume that you get around a 7% annual return on it (a typical estimation amount based on past performance). That 7% return means that in one year, your $100,000 will be $107,000. The year after it, that $107,000 earns interest and is now $114,490. Obviously it’s not a smooth 7%, but on a long enough timeline, it should work out to around that. But your freedom goal isn’t necessarily to let it keep compounding all the time, rather, to take out enough to live on each year. The generally agreed upon safe amount to take out is 4% per year to account for inflation and to be secure in market downturns. So, instead of letting it go 100, 107, 114, at the end of the year you’d take out 4,000 and it would only go up to 103. That 4,000 is your investment income. But 4,000 isn’t enough for financial security many places, so you need to figure out how much you need to have invested. To do that, take your financial security number, multiply it by 12 to get the annual number, then by 25 (the inverse of 4%). That’s the number you need to have invested in order to live off of the investments. If your goal is $2,500, then you need $750,000. That doesn’t mean you need to actually “save” $750,000, though, since as you’re investing it it’s earning interest. If we assume a 7% annual return, then you can reach $750,000 in 10 years contributing ~$4,200 a month (or ~$500,000 total). If you take 30 years, it’s $650 a month and $234,000, you get the idea. And there you have it! Invest that much money, and you’ll have financial freedom by living off of the interest. Now normally, this is where most “financial freedom” guides and goals stop. But, personally, I find that way too slow and boring, which is why we have a way to get there faster. While investment income is extremely slow but fairly stable, passive incomes streams can develop quickly with the unfortunate side effect of higher volatility. You could get your passive income up to a point where it’s sustaining your lifestyle in just a few months. But, on a random month that income could completely disappear for unforeseeable reasons and you’d be stuck. While your investments will certainly vary from year to year and go down significantly a few times in your life, they’re unlikely to go to zero overnight. But what’s magical about passive income is the effect that it has on how quickly you can save up your investment income, and how much you need to have saved up. Let’s say that your Financial Security threshold is $2,500 a month. From our math before, that means that you need to have $750,000 invested to get the returns you need. Now imagine that you have $1,000 a month in passive income. With that $1,000 a month, you’re not only saving more money, but you also need less of it saved. Assuming you can maintain a $1,000 a month passive income, you only need $1,500 a month from investments now, or $450,000 saved. If you wanted to get to $750,000 invested in 10 years, starting at nothing, you’d need to be putting away $4,200 a month. But with $1,000 a month in passive income reducing your goal, now you only need to save $2,500 a month. That’s still a lot, but it cuts the monthly investment almost in half, and saving it will be easier now since you can maintain your income and funnel all of that passive income into your savings. So while you could get to Financial Freedom purely from investments, it would be slow, and while you could get it quickly from passive income, it’d be unstable, so the best solution is to combine them. These are ordered in terms of how much leverage each step provides. Decreasing the amount you need will speed everything up the most, followed by maximizing investing, followed by passive income. You should only move from one step to the next once you’ve sucked every reasonable drop out of the step you’re on. The most important step for making this rapid retirement reasonable is reducing the amount that you need invested to pull it off. By doing this first, you both decrease how much you need to have saved, and increase the amount you have available to save. Every $100 you can reduce your monthly costs by reduces the amount you need saved by $30,000. If you want to pull this off within 10 years, that means you can invest $180 less each month and still pull it off. Decreasing your monthly expenses by $500 then means that you need to save almost $900 less each month, and you’ll have that $500 for investing with, making everything even easier. I’m not going to suggest you go full Mr. Money Mustache and move to middle America, ride a bike everywhere, nitpick your groceries, and never travel. You could if you want, and it would speed things up considerably, but it’s not really the lifestyle that I want or that I assume you want. I like traveling and eating out and drinking wine and not having to worry or feel guilty about every single purchase. What I will suggest though is looking at what you’re spending money on now and seeing how you can reduce it in a few key high impact areas, especially by maximizing your savable income. Depending on how mobile you are, going to a state where there’s no income tax is going to make a huge difference in the amount you can save. If you’re making $100,000 living in California, you’re paying ~$6,000 in state income taxes. If you move to Texas, Florida, Washington, Alaska, Wyoming, or South Dakota that becomes 0. That alone would account for a $500 monthly saving, assuming you can maintain the same salary. Find a smaller apartment, get a roommate, move to a different part of the city, ditch the home office in favor of coffee shops, whatever works for you. This might also solve itself just by moving to a different city: Going from San Francisco to Austin would not only remove the state income tax, it would also cut your rent by 50%+ if you keep the same kind of living conditions. Ditch your car and use Uber and public transit instead. Live somewhere walkable. Trade down to something cheaper or more fuel efficient. Don’t stay in hotels, use Airbnbs and hostels. Play the credit card game and fly for free. Travel on off days to significantly reduce flight expenses. Buy in bulk from Costco. Ditch the gluten, but still eat plenty of rice and beans. Make fat a bigger part of your diet, especially from butter and oil. Depending on how much of an impulsive Amazon buyer you are (I’m terrible), create a rule for yourself like waiting 2 weeks for each purchase. Anything you can wait 2 days for you can wait 2 weeks for. By far the highest leverage thing you can do though is move to a city with a cheaper cost of living and 0 or no income taxes, live in a central and walkable part of it, learn to cook, and create a rule for yourself around delaying buying things you don’t immediately need. That can mostly be done in one fell swoop and should cut your monthly expenses by anywhere from 25% to 75%. Anything you’re paying interest on needs to be reduced ASAP. That could be credit cards, loans, financed purchases, anything. Paying interest on anything is effectively burning money since you’re getting no additional utility for it, so any money you have available for saving, investing, or financing your own projects should go to paying down interest first. Make that priority #1 if you have any debt that you can accelerate paying down. Alongside paying down debt, you also want a savings cushion for safety. If you don’t already have 3-6 months in expenses saved away somewhere, do that before you start investing. You don’t want to tie up your money in the market only to need some emergency funds. I do 6 months since I’m self-employed and have a much more variable income, but depending on how regular your payments and how secure you think they are you could keep less liquid cash on hand. Once you’ve decreased your debt as much as possible (ideally to 0) and saved up for a rainy day, then you can start maximizing your investments. 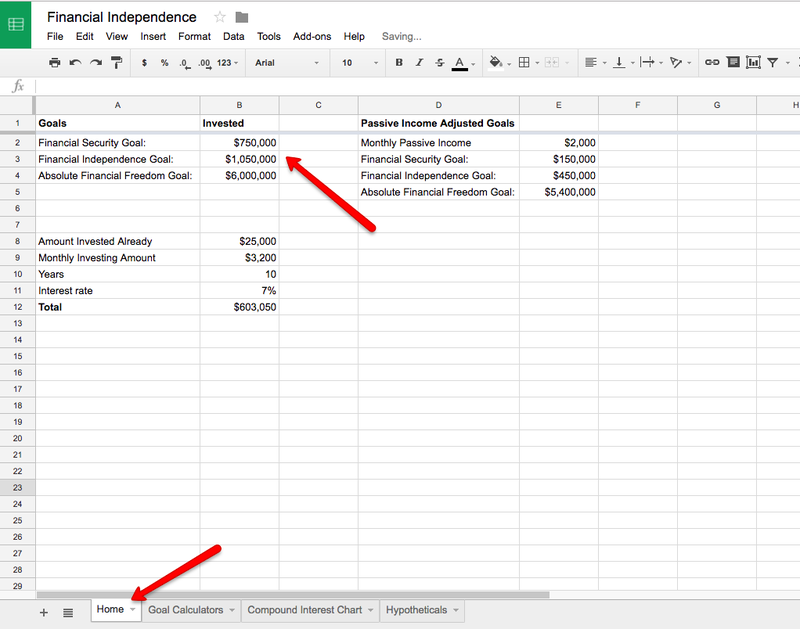 This is fairly simple and unglamorous, but it’s the most important piece for eventually reaching your financial freedom goals. You need to take all of the leftover money and shovel it into an investment account. You have a few options for where and what you invest in, but I strongly recommend an automated advisor like Wealthfront (what I use) or Betterment (other good option) for all of the reasons outlined in this article. Set it up to take out a set amount each month, and if you stumble into any extra money beyond your normal income amount, invest that as well. Again, much more on that in this article. Once your costs are reduced and you’re investing everything you reasonably can, the best thing you can do is speed it up by increasing whatever income you’re currently earning, or earning a bit more on the side. This would include negotiating a higher salary, taking up some freelancing gigs, anything to increase the amount you’re earning in your current situation without also increasing your spending. But the best way to do that, of course, is to create some passive income. The final step in your plan for reaching financial freedom as fast as possible is to create some passive income that can reduce the amount you need to “retire,” and that can speed up how quickly you save for it. And assuming you’ve done everything in reducing your expenses and maximizing how much you’re investing, then the next step is to look into creating some passive income streams. The most important rule here is DON’T LOSE MONEY. You can spend a little, but do NOT take all of your hard earned savings and pour them into something that won’t give you a positive ROI. If you’re inexperienced in small entrepreneurial projects be very, very careful here. Many people have burned their savings in pursuit of passive income, so you need to be smart. And while it’s beyond the scope of this article to explain exactly all the ways to build passive income (though the lifestyle business article is a great place to start), if you stick with it and focus on areas where you have knowledge and experience, it’s very doable. 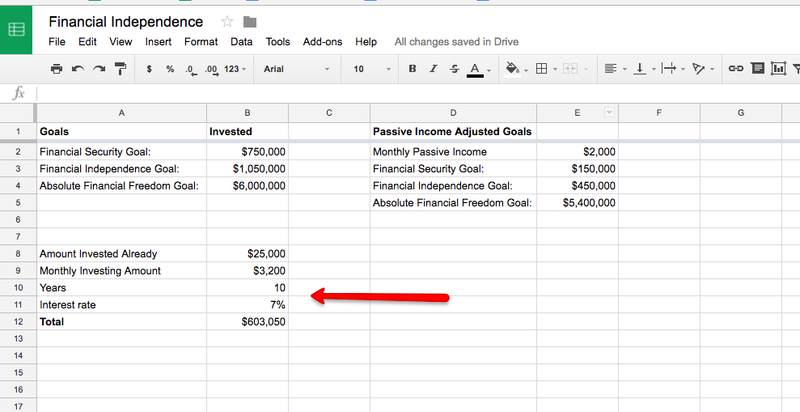 What will help is to set a goal for the amount of passive income you want to generate, and then add that to your spreadsheet as motivation to build it. When you see how much it can offset the amount you need saved, you’ll be even more motivated to make it happen. 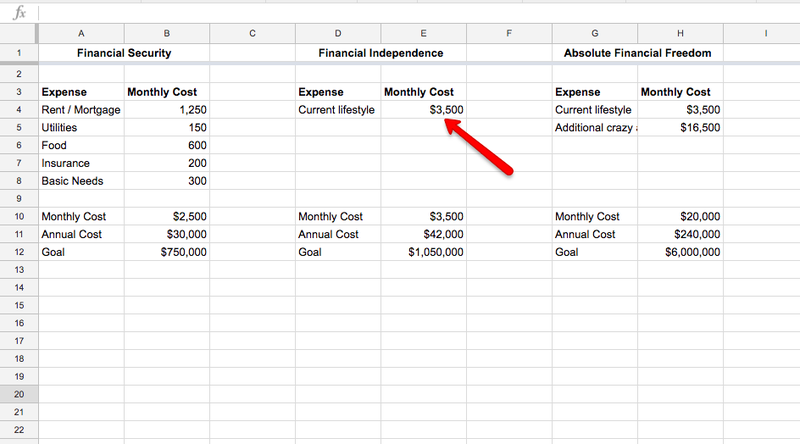 Create your financial freedom calculator by making a copy of mine.